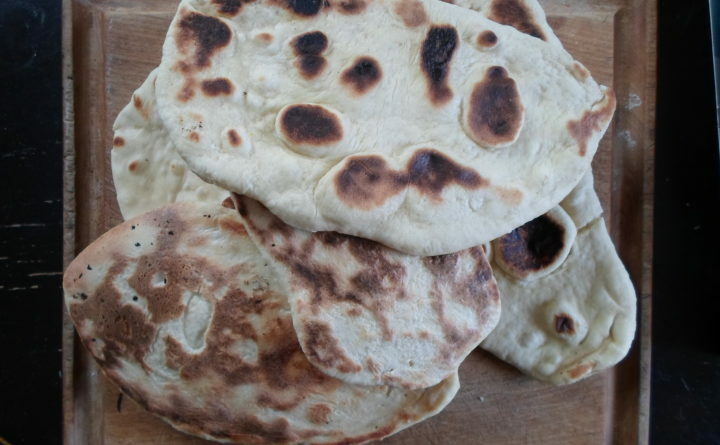 Perfect for scooping up soupy and stew-y dishes, naan is a yeasted flatbread from Asia, particularly India and Pakistan, which traditionally is made in a wood-fired clay tandoor oven. However, you and I can make it at home on a cast-iron skillet. Yes, naan can be purchased at the grocery store along with other flatbreads, such as pitas, flour tortillas, focaccia and lavash, but of course all these taste so much better freshly made and still warm when served. This recipe has kicked around in the “try these out” file for a long time, scrawled in pencil on a piece of paper from goodness knows where, and with cold weather upon us, the idea of spending some time baking over a hot stove was downright appealing. As a category, stove-top breads have interested me because I have an electric oven, and I like the idea of being able to make fresh bread even when the power is out. I took a quick trip to YouTube where I saw a few helpful videos showing how to use a cast-iron pan for the baking process, as you could do as well if you have access to a computer or smartphone. 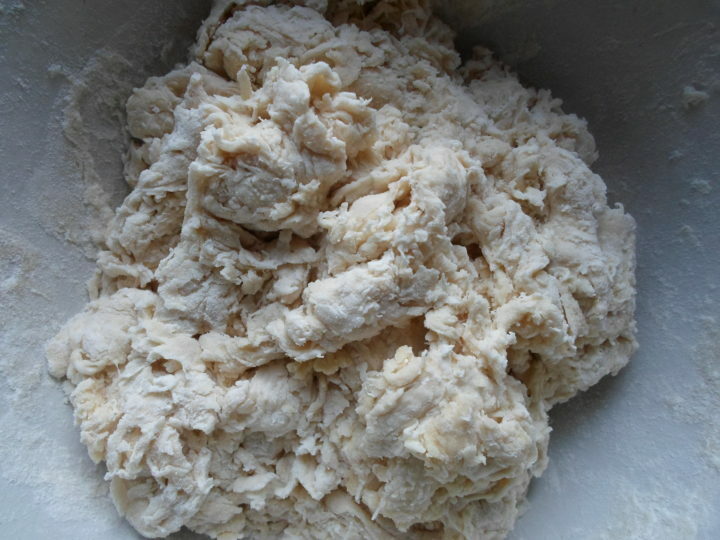 Once the ingredients are mixed, you will see the dough is fairly dry and shaggy but continued kneading smooths it out. You will also find it will not stick your hand as much as other breads, and when sufficiently kneaded, springs back when poked. It needs only one rising. Several recipes say “cover with plastic wrap” for the rising time. I hope you won’t use plastic wrap because we do not need that much more wasted plastic. I used a clean, damp dish towel, which works perfectly well. The recipe called for an egg and I used one, but many naan recipes do not require eggs. Next time I won’t. You can consider it optional but add a little more water to make up for it. 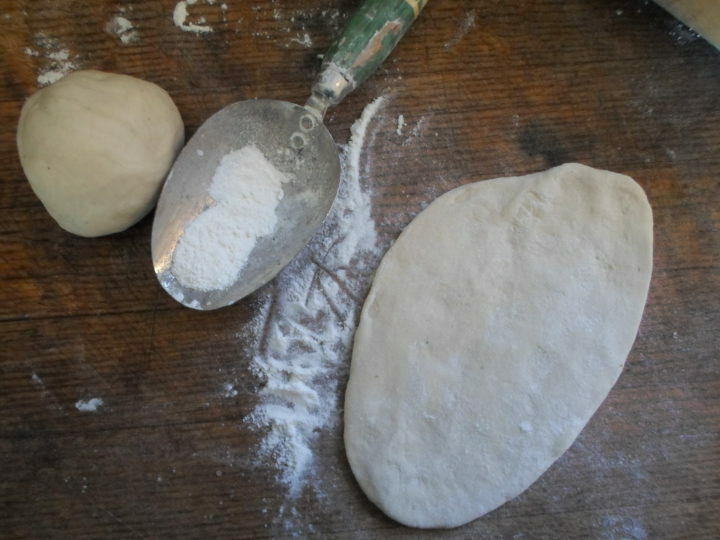 You punch this dough down after rising, divide it into balls to form into individual breads, then allow it to rest, just as you allow pizza dough to rest before spreading it. 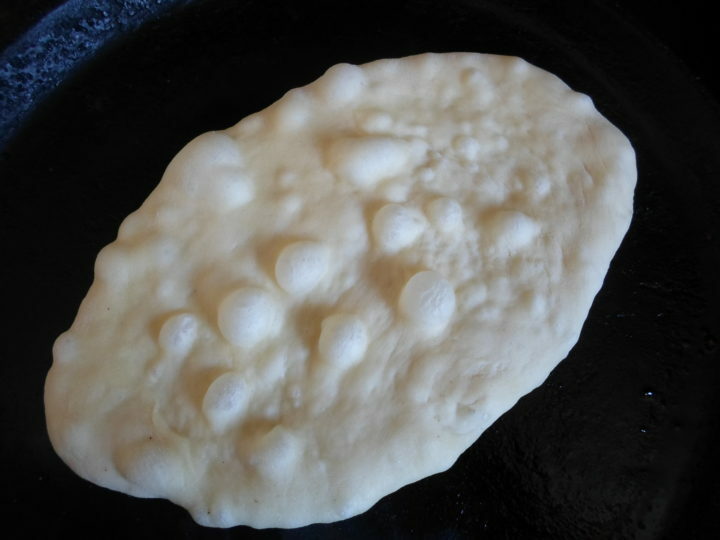 One method I saw recommended rubbing the exterior of the naan with water before baking; another oiled it. I used water. It is helpful to have a lid to cover the naan as it bakes on the pan, which needs to be smoking hot. Little scorched-looking spots are normal, even desirable. It takes hardly any time at all to finish one bread, and you can roll the next while one is baking. Like most breads, when baked, naan sounds a little hollow when you tap it. 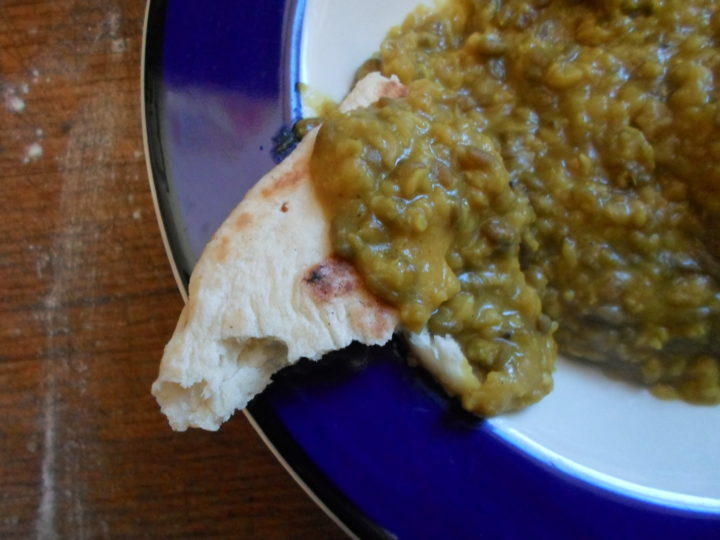 Maybe naan isn’t the kind of bread you usually make sandwiches out of, but to eat out of hand, you can split them open and stuff them with something delicious. I like them torn up, like crusty breads, to scoop and clean my bowl with. 1. Combine the yeast, sugar and warm water, and allow to sit for 5-10 minutes until the mixture has a slightly foamy appearance. 2. Mix the flour, salt and baking powder together in a large bowl. 3. Add the yeast mixture, plus milk, yogurt, egg (if used), oil and three-quarters cup of warm water. Mix until the dough comes together in one ball, adding only a little more water if the dough does not come together and develop elasticity. 4. When the dough is smooth and springs back if poked, cover with a damp towel and let rise for about an hour or until doubled, which may take a little longer. 5. Punch down, knead and divide into eight pieces. 6. Knead each piece lightly, pulling the edges into the center to form a ball. Let rest. 7. Heat a cast-iron pan until smoking hot. 8. Stretch and roll a ball with a rolling pin until you have a disk or rectangle a little less than a half-inch thick. 9. Dip your fingers into water and lightly rub the exterior of each disk on both sides. Lay it on the pan, cover it and check after 1-2 minutes. 10. Allow it to heat through, brown on the bottom and form bubbles on the top. Flip it over and bake for another 1-2 minutes. Remove from the pan. 11. Repeat for each ball of dough.